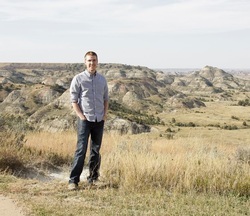 Originally from the farmlands of northwest Iowa, I am a transplant to central North Dakota. I've alternated my education between art and theology [MFA from the University of North Dakota, MA in Theology from Sioux Falls Seminary (SD), and a BA in Art from Northwestern College (IA)]. As a printmaker and photographer, my work has been exhibited internationally in South Africa, China, Central and South America; nationally in New York, New Jersey, and Texas; and across the Upper-Midwest. I am currently an Associate Professor of Art at Minot State University in Minot, ND, where I teach photography, a little printmaking and book arts. I also have the pleasure of directing the BFA program, and co-directing Flat Tail Press. My interdisciplinary interests attempt to bring theology and the arts into a dynamic conversation. In particular, I enjoy exploring how the sacramental imagination, as formed through our liturgical participation, engages culture, place/space, and the visual arts. My artistic media, and preferred processes, are as varied as my interests. My work ranges from Cyanotypes to Lithography which allows me to engage projects with a wide array of possibilities. I am joined in this journey with my amazing wife Karina and our sons Willem and Mathis.